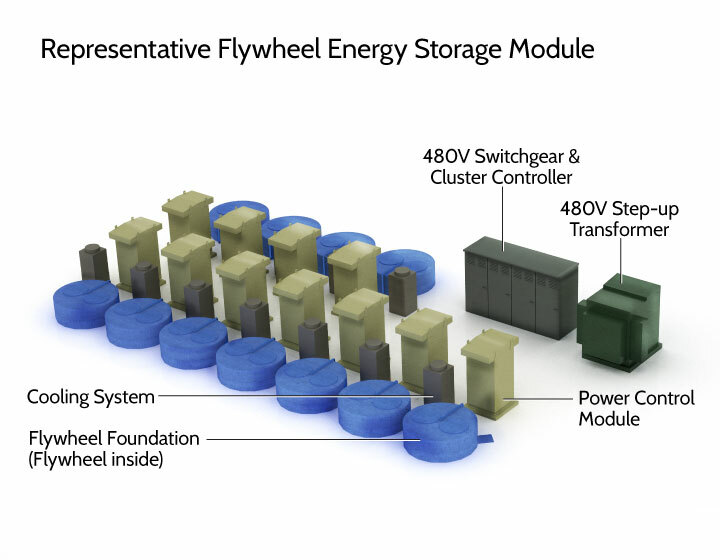 Like building blocks, single flywheel modules fit together with others to build a complete flywheel energy storage system. The system is designed to allow siting and operation at any size from 100 kW to multi-MW power blocks. This modular configuration minimizes site footprint and enables owners to place the exact amount of stabilizing resource in the exact location needed. The modular design also ensures flywheel storage systems can be delivered and assembled in remote locations. 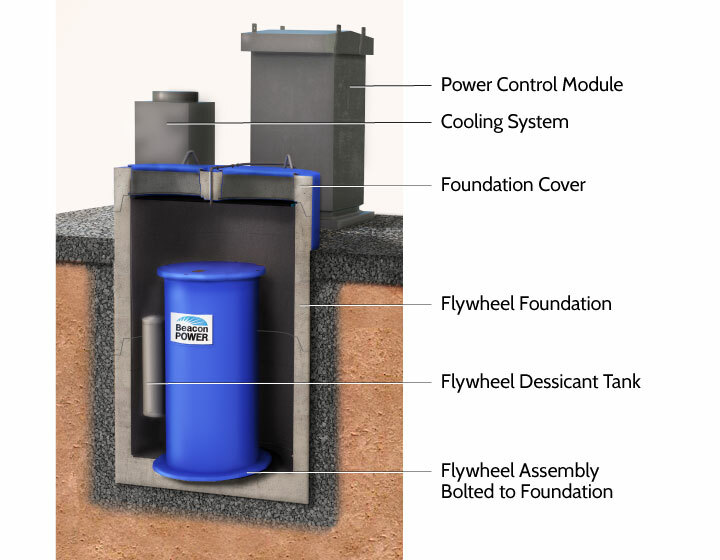 A flywheel energy storage module is a stand-alone unit, requiring just 480V AC power and communication connections to operate. Each module consists of a flywheel, power control module, flywheel foundation, cooling system, and the necessary mounting and support facilities. Modules are designed to function on a fully independent basis. During construction, three-piece, pre-cast concrete flywheel foundations (similar in construction to highway storm drains) are installed in the ground, leveled, and surrounded by crushed stone. Concrete pads are built for the PCM, cooling systems and switchgear. Underground conduit is placed to run power and signal cables between components. Beacon’s Power Control Module is an outdoor-rated, pad-mounted electronics package. Design criteria include reliable operation in extreme conditions found in hot desert environments like the Mojave in California, hot-humid locations like Puerto Rico or arctic conditions like Alaska. Beacon flywheel systems are designed to require low maintenance and our modular architecture allows units to be self-contained so service issues have minimal system impact.